I have to say that this is far more accurate view of what I have understood Anglican structures to be, rather than this newly fabricated “national church” which ironically seems to have been constructed for the sole purpose of attempting to win lawsuits based on hierarchical Roman Catholic structures. What do we make of the quote from Rowan Williams? It would be very helpful to see the entire letter. 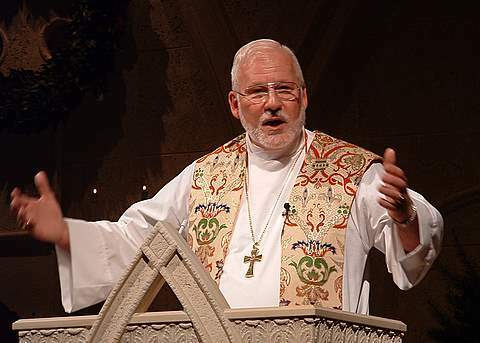 “On Thursday, October 18, 2007, the Rectors and Senior Wardens of seven Parishes of the Diocese of Central Florida and two Church Planters met with Bishop John W. Howe and representatives of the Diocese to discuss the possible scenarios by which all or part of the congregations may disaffiliate from The Episcopal Church. “Each Parish will now enter a process of conversation and negotiation with the Diocese based on its particular circumstances. Bishop Howe reiterated his commitment to provide pastoral care both to those who leave and to those who wish to remain. “All parties agreed to enter into these negotiations in good faith using Biblical principles in an effort to avoid litigation and scandal to the Church of Christ”. As Bishop of the Diocese of Central Florida, and as stated above, I remain committed to providing pastoral care both to those who wish to leave and to those who wish to remain. Individuals who wish to leave the Diocese of Central Florida and form another congregation are to be honored as brothers and sisters in Christ. The Diocese will do everything in its power to make their departure from the Diocese of Central Florida and The Episcopal Church a peaceful one without rancor or recrimination. At the same time the Diocese is bound to work within the Constitution and Canons of The Episcopal Church which state that a Parish holds in trust all real and personal property for the benefit of the Diocese and The Episcopal Church. We have a solemn responsibility to protect the interests of the Diocese and the larger church. We cannot and will not abandon those who wish to remain as members of The Episcopal Church and we will work diligently to determine whether in fact there is a sufficient number of Episcopalians in a given congregation to constitute a viable continuing congregation able to meet and worship in its own current facilities. We are developing a detailed protocol for dealing with those who wish to disaffiliate, and I will discuss it with the clergy at our annual Clergy Conference this week. Only after receiving their input will this protocol be finalized. For now, let me assure you that all of you will have a say in these decisions, and they will not be made by Rectors and Vestries acting alone.